"Lowry Field" redirects here. For the "Lowry Field" baseball facility renamed Jackie Robinson Field, see Lowry Sports Complex. For the former James A. Lowry Municipal Airport, see Northport, Washington. For the airfield at the nearby 1942 Continental-Denver Modification Center, see Denver Municipal Airport. Lowry training for Boeing B-29 Superfortress pilot qualification and for B-29 operational crew readiness began in 1943, and the base had a July 1943–Jan 1944 clerical school. [ dubious – discuss] In 1944 expansion of Lowry's airfield was planned  and Lowry gained B-29 Flight Engineer training. Lowry transferred under Technical Training Command in mid-October 1945 ( Air Training Command on 1 July 1946) and by the end of 1945, Lowry's separation center was processing an average of 300 discharges a day. The nearby bombing range was transferred from Buckley Field, by authority of Technical Division, Air Training Command, to Lowry A.F.B. on 20 September 1946. In July 1947, formal courses in Intelligence Training were established at Lowry for combat reporting, photographic intelligence, prisoner of war interrogation, and briefing and interrogation of combat crews. Not to be confused with Air Technical Intelligence Center. The Armed Forces Air Intelligence Training Center was established at Lowry effective 1 July 1963 with student training beginning on 17 July[ citation needed] (by 14 March, "the Defense Department had assigned responsibility for all DOD air intelligence training and advanced training in photographic, radar, and infrared interpretation to the Air Force.") In 1965, the runway was closed, and all Lowry AFB flying activities moved to nearby Buckley Air National Guard Base. Ten courses from Amarillo AFB were planned to be moved to Lowry in mid-1968, :159 and Amarillo's 3320th Retraining Group for convicted airmen moved to Lowry 1 July-1 September 1967. In 1974, the Air Staff approved Lackland AFB's Special Treatment Center to transfer to the 3415th Special Training Group at Lowry AFB. In addition to Air Force personnel, the U.S. Navy also sent junior officers (ensigns and lieutenants) for initial intelligence training at Lowry, along with enlisted personnel newly graduated from boot camp for their "A" school instruction as intelligence specialists. Construction began in 1970 for enlisted and officer billeting facilities to replace World War II vintage barracks, five 1,000-man dormitories and completed by 1974, a 187-space mobile home park. Other added facilities included a youth center, a child-care center, a chapel (in addition to the 1941 chapel), and a new Airmen's Open Mess. In 1976, the Defense Finance and Accounting Service (formerly Air Force Accounting & Finance Center) & the Air Reserve Personnel Center opened in the Gilchrist Building (Building 444). The AFAITC school remained at Lowry from 1963 to 1988, before moving to Goodfellow AFB, in San Angelo, Texas. US Navy intelligence training for both junior officers and enlisted personnel was shifted to the new Navy Marine Corps Intelligence Training Center (NMITC) at Dam Neck, in Virginia Beach, Virginia. LGM-118 Peacekeeper ICBM training began at Lowry in 1985, and after Lowry became the primary training center for USAF space operations, Undergraduate Space Training's 1st graduation was in 1987. The 3301st Undergraduate Space Training unit moved to Vandenburg AFB, CA in 1991, prior to Lowry AFB closure. Lowry also handled ground & armament training for several interceptor models, the A-10 Thunderbolt II, and the B-1 Lancer. 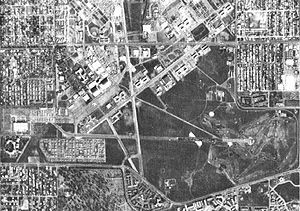 After being considered for closure in 1978 and since "Lowry lacked a runway"  (all runways closed and all USAF flight operations terminated, July 1966),  Lowry AFB was designated for closure by BRAC 1991. The 3400th Technical Training Wing inactivated on 27 April 1994, and the base officially closed on 30 September 1994. The National Civilian Community Corps used Lowry facilities from 1994 until 2004; and Space Systems Support Group Detachment 1 "located at the former Lowry AFB" in March 1995 moved to Peterson AFB. The Bonfils Blood Center "became the first commercial tenant at Lowry" in the former commissary during September 1995, and the site development company was presented facility and real estate awards in 1997  (asbestos was remediated from the Formerly Used Defense Site  of "1,866 acres"—remediation at buildings included Building 402:PCBs, 606: groundwater, & 1432: soil ). ^ "U.S. General Accounting Office". www.gao.gov. ^ a b c d Denver Suburbs Multiple Property Submission (PDF) (Report). National Park Service. Beginning in 1937, the Works Progress Administration completed one of its largest projects in Colorado, with more than 1,500 workers involved in renovating the 17 existing Gove and Walsh designed sanitarium buildings for the school, constructing infrastructure on the 880-acre campus, and building runways. Four modular hangars disassembled at other posts arrived at the new installation. ^ a b c d e Manning, Thomas A. (2005) [1990s for 1943-1993 version]. History of Air Education and Training Command: 1942-2002 (PDF) (Report). A-090203-089. Office of History and Research. p. 146. ASIN B000NYX3PC. Archived from the original (PDF) on 29 October 2013. Retrieved 13 September 2013. …a re-organization of internal base structuie. The major change was the replacement of the base unit organization with a base-wing set-up. All ATC bases were to have a wing headquarters with three subordinate groups: training, maintenance, and airdrome. However, in August 1947 this reorganization was deferred until 1948. … 1951 "Plans called for FTAF to be headquartered at Randolph and TTAF at Lowry … Lowry and Keesler developed the first general [missile] courses in 1956, and plans called for other courses to open at Chanute in 1957, Amarillo in 1958, and Sheppard in 1959. … In early 1965, ATC began making plans to close its training activities at Amarillo and…relocate 29 technical courses: 7 to Chanute, 10 to Lowry. 5 to Sheppard. and 7 to Lackland." ^ a b c Mueller, Robert (1989). Air Force Bases: Lowry Air Force Base (PDF) (Report). Volume I: Active Air Force Bases Within the United States of America on 17 September 1982. Office of Air Force History. pp. 331–337. ISBN 0-912799-53-6. Retrieved 2013-08-15. ^ Kurtz, Paul (25 August 1943). "Sports Stew – Served Hot" (Google news archive). newspaper tbd. The Pittsburgh Press. Retrieved 2013-02-11. ^ "Bombardier Training: …Overview". Ancestry.com. Archived from the original (transcribed text from various sources, including St. John) on 14 June 2012. Retrieved 2012-07-10. ^ "Mace and Matador Missile Instructors". www.mace-b.com. ^ Neufeld, J. (1990). The development of ballistic missiles in the United States Air Force, 1945–1960 (Report). Office of Air Force History. ISBN 0-912799-62-5. ^ "Eisenhower Chapel (509508)". Geographic Names Information System. United States Geological Survey. Retrieved 2013-09-21. ^ Capt Paul J. England, USAF, serving with the 3301st at the time it moved. ^ "title tbd". Guardian. Peterson AFB: contractor for Air Base Wing public affairs: 9. March 1995. ^ Huff, Mickey; Censored, Project (4 October 2011). "Censored 2012: The Top 25 Censored Stories of 2010-11". Seven Stories Press – via Google Books. ^ a b "Former Lowry Air Force Base, Colo" (fact sheet). Air Force Civil Engineer Public Affairs. 6 February 2013. Archived from the original on 17 February 2013. Retrieved 22 September 2013. AFCEC has invested $84 million on BRAC cleanup actions at the former installation, and the final stages of cleanup are underway. ^ "7581 E Academy Blvd, Denver, CO - Google Search". www.google.com. ^ [ full citation needed] This article incorporates public domain material from the Air Force Historical Research Agency website http://www.afhra.af.mil/.